Cluster formation games are games in which self-organized groups (or clusters) are created as a result of the strategic interactions of independent and selfish players. We consider fractional hedonic games, that is, cluster formation games in which the happiness of each player in a group is the average value she ascribes to its members. We adopt Nash stable outcomes, where no player can improve her utility by unilaterally changing her own group, as the target solution concept and study their existence, complexity and performance for games played on general and specific graph topologies. 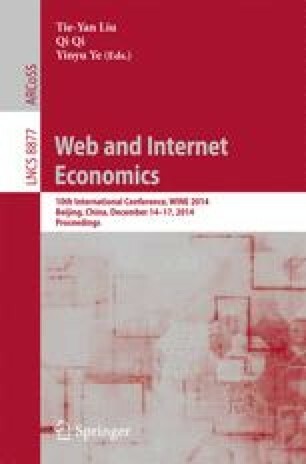 This work was partially supported by PRIN 2010–2011 research project ARS TechnoMedia: “Algorithmics for Social Technological Networks” and by COST Action IC1205 on Computational Social Choice.